Killed in Action on Friday 27 July 1917 aged 20 during the 3rd Battle of Ypres. (Welsh Fusiliers War Diaries). David Owen Darley Davies was born in Llanidloes, Montgomeryshire 6 February 1897. The family moved to Holywell, Flintshire during 1909 and resided at Wesley House, Llanasa, Holywell. The 1911 census tells us that the head of the family was David Darley Davies aged 50 a Wesleyan Methodist Minister. His wife Mary Ellen Darley Davies aged 40 and their daughter Helen Myfanwy Darley Davies aged 9. David Owen Darley Davies was at that time attending Kingswood Wesleyan Public School, Landsdown Road, Bath and does appear on the 1911 England Census residing at that address. David left school aged 17 and began employment as a Bank Clerk with the London City and Midland Bank at their Flint Branch. On 6 December 1915 aged 19 years 1 month, he enlisted at Flint, Flintshire as a Private with the Royal Welsh Fusiliers. On enlistment he is described as 5′ 7″ tall, chest measurement 34″, extension 3″, physical development good and he is described as fit for military service. His Short Service Record (Attestation Certificate can be viewed on www.ancestry.co.uk) which shows that it was for the duration of the war. What is interesting to note is that the witness to his Attestation was James Ayer the father of Leonard Stuart Ayer who also appears on the Holywell War Memorial and was also employed as a Bank Clerk with the London City and Midland Bank. 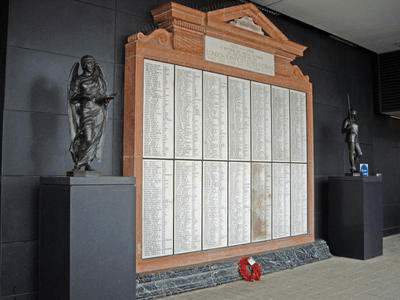 The London Joint City and Midland Bank WW1 Memorial at Canary Wharf, London, on which Private David Owen Darley Davies is remembered. 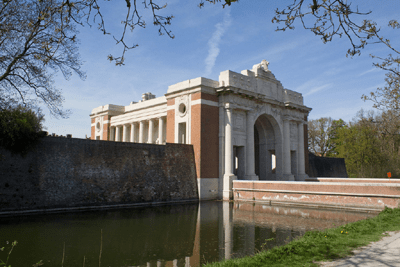 He embarked for France at Southampton on Monday 11 December 1916 and later posted to Ypres, Belgium where he was killed in action on Friday 27 July 1917. Ref No 12586/37611 – Wesley House, Holywell 18 August 1917. 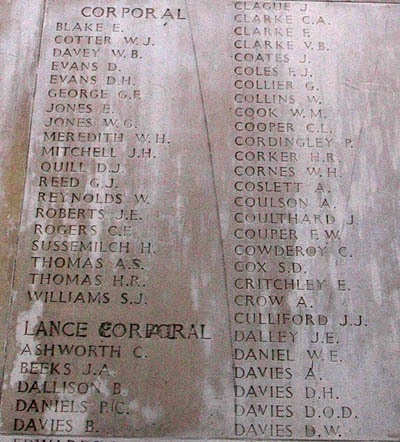 Photograph of Panel 22 at The Menin Gate Memorial, Ypres, Belgium, showing the name of Private D.O.D. Davies. On 7 January 1918 a payment of £4.19s.11d was made by the War Office to the Rev David Davies, this being monies owed to his son David. On 31 October 1919, a further payment which is recorded as a War Gratuity of £6.10s.0d was also made to him. There is a Flintshire Roll of Honour card for David Owen Darley Davies at the County Archives Office, Hawarden, containing details of medals awarded.